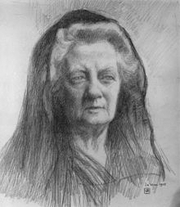 Jane Ellen Harrison was born in Yorkshire, England. Her mother died shortly after her birth, and she was raised and educated by governesses. She learned German, Latin, ancient Greek and Hebrew in childhood, and later was proficient in 16 languages. She attended Cheltenham Ladies College and the University of Cambridge. Between 1880 and 1897, she studied Greek art and archaeology at the British Museum and then supported herself by giving public lectures at the museum and at schools. Her talks became widely popular. She traveled to Italy and Germany, where she met scholars Wilhelm Klein, Wilhelm Dörpfeld, and D.S. MacColl. Her early book The Odyssey in Art and Literature was published in 1882. In 1888, she began to publish articles on Greek art and culture in Woman's World, the periodical edited by Oscar Wilde. She translated and updated Mythologie figurée de la Grèce (1883) by French archaeologist Maxime Collignon as Manual of Mythology in Relation to Greek Art (1890). In 1903, her masterpiece Prolegomena on the Study of Greek Religion appeared. Today she is considered one of the founders of modern studies in Greek mythology. She was the center of a group of classical scholars known as the Ritualists at Cambridge, where she was a lecturer at her alma mater, Newnham College. She retired from Newnham in 1922 and moved to Paris briefly to live with Hope Mirrlees. She and Mirrlees returned to London after her health began to fail. She published her memoirs, Reminiscences of a Student's Life (1925) with the Hogarth Press of Leonard and Virginia Woolf. Jane Ellen Harrison is currently considered a "single author." If one or more works are by a distinct, homonymous authors, go ahead and split the author. Jane Ellen Harrison is composed of 6 names. You can examine and separate out names.